CORAL GABLES, Florida, USA- Virgin Islands hurdler Lakeisha Warner aka ‘Mimi’ did her university team and the Virgin Islands proud when she captured a silver medal at the 2018 ACC Championships in Florida, USA on May 12, 2018. 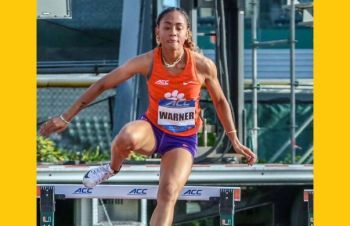 Warner, a sophomore from Clemson University, was 2nd in the 400m Hurdles Final in a Personal Best and OECS Record, 57.23 seconds. She was edged out for the top spot by Samantha Gonzalez of University of Miami, who registered a Personal Best 56.77 seconds. Third was Andrenette Knight of the University of Virginia in a Personal Best 57.95 seconds. Warner was the fastest qualifier in the four heats that saw 23 athletes take to the starter’s gun. She clocked 57.80 in Heat One. Always continue to do your very best. I am so happy for proud mom Ann and Grandma Leela! Mimi is so talented. Her only problem is her tiny size.